As we approach another school year, many of us will be packing lunches for our kids, and often times for ourselves as well. I always end up trying to find new and fun lunchbox meals outside of the same, boring old sandwiches. Well, I’ve come to the rescue with my Tuna and Apple Lunchbox Sammies! 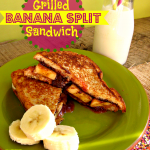 They’re a new, fun lunch idea that both you and your kids will totally love! The delicious tuna salad is made from Bumble Bee Premium Albacore Tuna in pouches. These handy Bumble Bee tuna pouches make prep really easy, and clean-up quick. 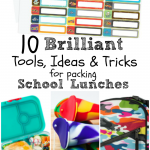 They’re perfect to open up, get lunches made and out the door in no time at all! I also like them, as they store easily in the pantry, and barely take up any space! (Nice bonus, right?!) The cans are great as well, and both are available at your nearest supermarket. 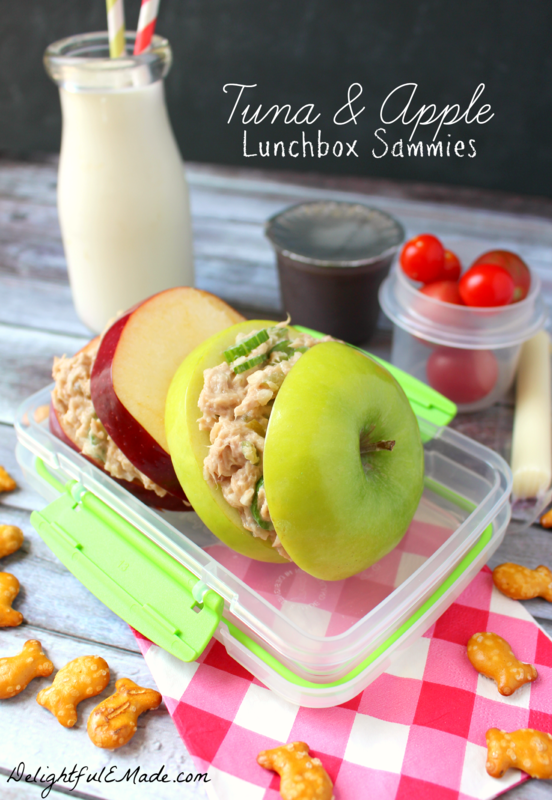 These Tuna and Apple Lunchbox Sammies make for great lunchbox treats! And I’m here to tell ya, that my 6-year-old who is a VERY picky eater, was quite intrigued by the idea of a Tuna and Apple sandwich. At first, he was leery, but after I dared him to take a bite, he quickly devoured a full sandwich. He said, “Mama, that was really good! 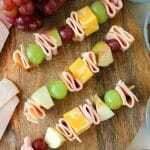 Lets have these for lunch again!” Music to this mom’s ears! The flavor and crunch of these sammies are truly fantastic!! I add minced onion, mayo, relish and diced celery to the tuna to enhance the flavor and give it a great crunch. 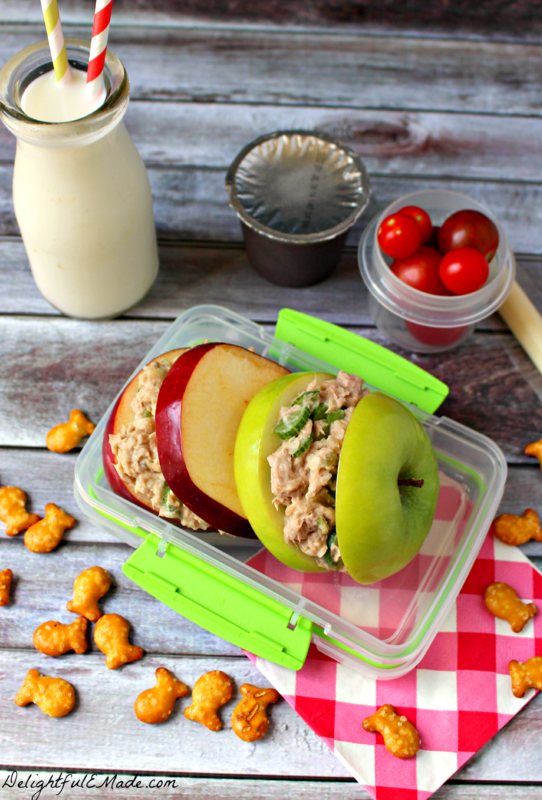 The savory tuna salad pairs perfectly with the sweet, tart flavor and texture of the Granny Smith apple. Soooo delicious!! 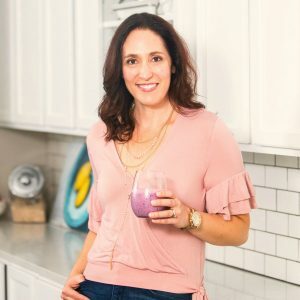 This is now my go-to lunch, as its healthy, flavorful and filling! Doesn’t get much better than this, am I right?! In a small mixing bowl, combine the tuna, mayo, onion, relish and celery. Stir until evenly combined. Set aside. Using a knife safely slice the large apple horizontally into four slices. Using the tip of a smaller pairing knife, cut a small circle into the middle of the apple slices, removing the core pieces. 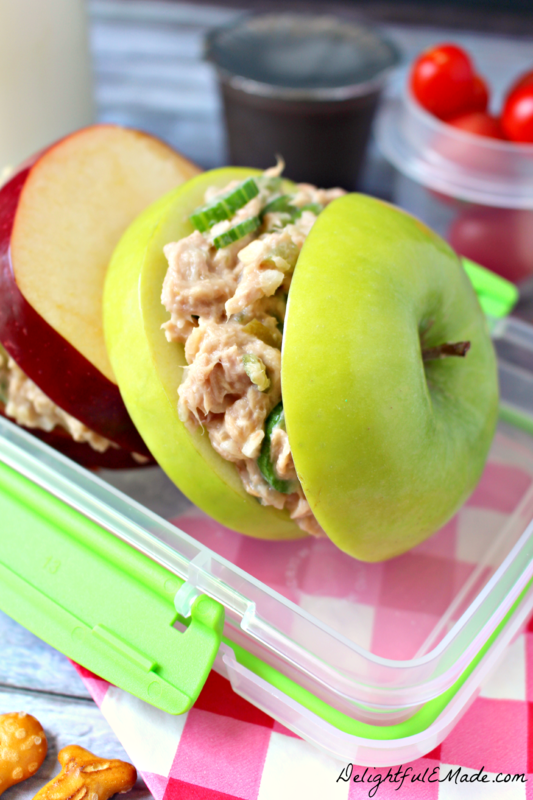 Spread the tuna mixture onto the apple slices and sandwich together. 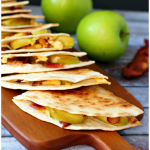 You may also spread over multiple apple slices or use the tuna as a dip. 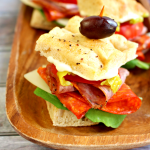 These sammies are not only tasty, they pack up great in any lunch. Keep cold with a lunchbox cold-pack, and you’ll have a tasty lunch that will keep you going strong throughout the rest of your day! These also make fantastic after-school snacks. 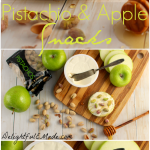 Use tuna salad as a dip with the apple slices. I like to keep a container of the tuna salad already prepared in the fridge, and take out when I want a quick lunch or an easy snack during the day. 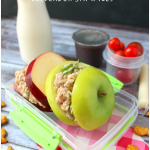 Whatever way you slice it, these Tuna & Apple Lunchbox Sammies will be a hit with everyone in your household. Don’t be afraid to try something new. My son (the giant picky-eater) tried something new, and in the process, discovered that tuna is a new favorite food! How great is that?! 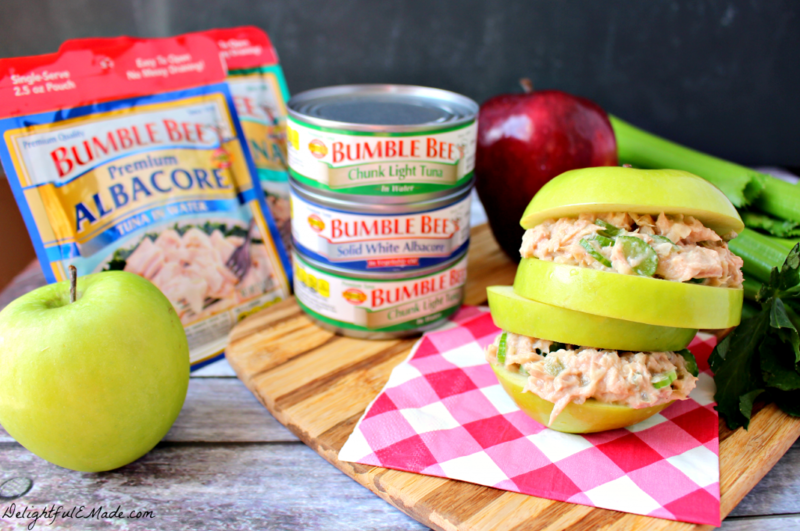 Looking for more great ways to enjoy Bumble Bee Tuna? Check out Bumble Bee’s Custom Recipe page and find some additional favorites that you’re family will surely enjoy. Do you have some fun ways to enjoy tuna? I would love for you to share them. Leave me a comment, and let me know. 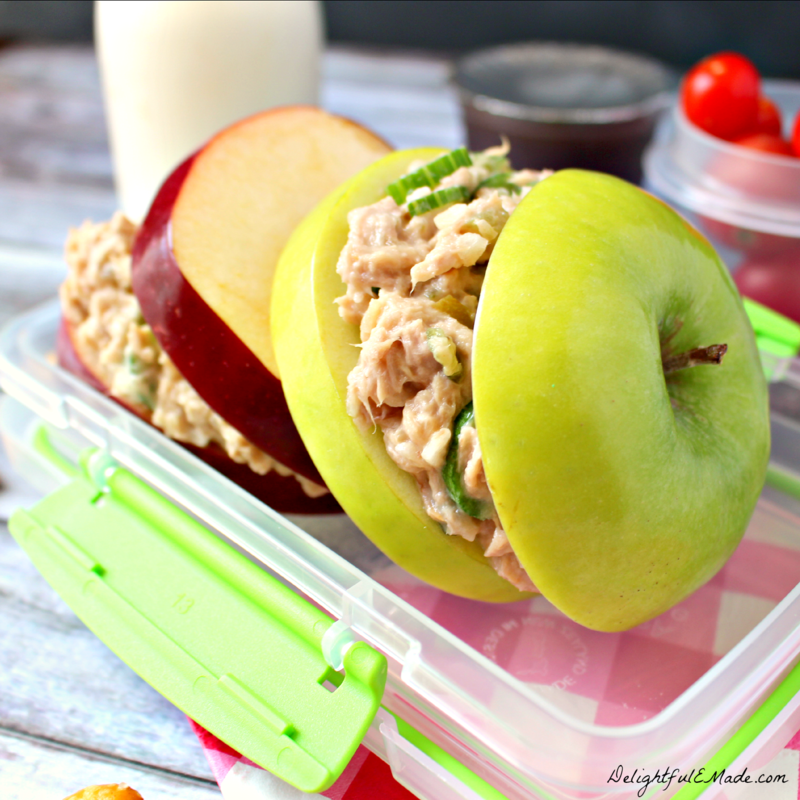 YUM, I love these tuna apple sammies! They look delicious and would be the perfect lunch! This is an adorable sandwich. It would be fantastic for a baby shower or wedding shower too. Erin what an adorable presentation!!! PINNED! Thanks so much, Mila! Thanks so much for stopping by! what a great idea! Thanks for sharing at the What’s for Dinner linky - and don't forget to leave a comment – if you comment and your post is featured next week, it will also get pinned and tweeted! This is such a good idea! I often dice up apples to put in my tuna salad but I like that you made them into sandwiches! Love this idea! It looks delish! These are so cute! What a great idea! Thanks for sharing at the Family Joy Linkup! Hope to see you again next Sunday! These look yummy for back to school. Thanks for sharing at the #InspirationSpotlight Party. Pinned & shared.